Our new septic tank access saddle makes it easy for septic tank owners, pump-out contractors and anyone requiring access to a septic tank to find, open and access septic tanks, to check on their operation and to periodically pump out the contents. Septic tanks accumulate and process household sewage. The tanks breed anaerobic (septic) bacteria that digest (eat) and reduce sewage to a concentrated sludge. Over time the sludge builds up and there is not enough free space for the bacteria to treat and consume new sewage. This reduces the tank’s treatment efficiency. If the septic tank does not function properly, untreated sewage will overflow into the disposal area causing it to fail. Failed disposal areas can create smelly, boggy areas in the garden. When a disposal area fails, it is expensive to fix, and usually must be replaced. To function properly and prevent costly repairs, septic tanks require regular maintenance—including periodic de-sludging by a pump out truck. 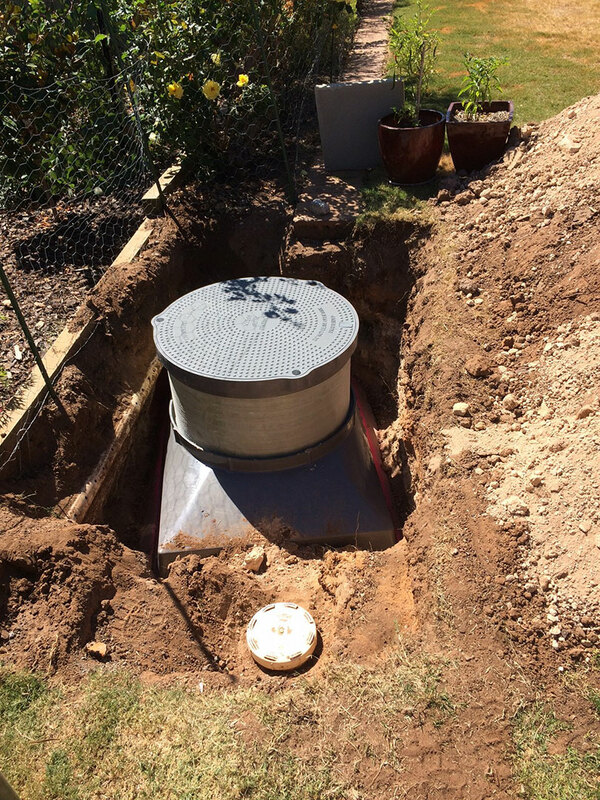 Unfortunately, in South Australia, Victoria and Queensland, many septic tanks are completely buried underground, making access for maintenance difficult. 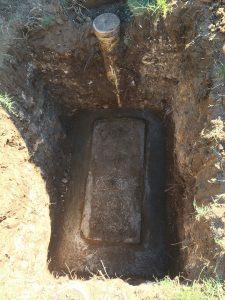 Some house and landowners do not even know the location of their septic tank as a buried tank has no location marker at ground level. This can also be a breach of council requirements. Nobody wants a choked septic tank threatening the health of their family, community and bank balance. 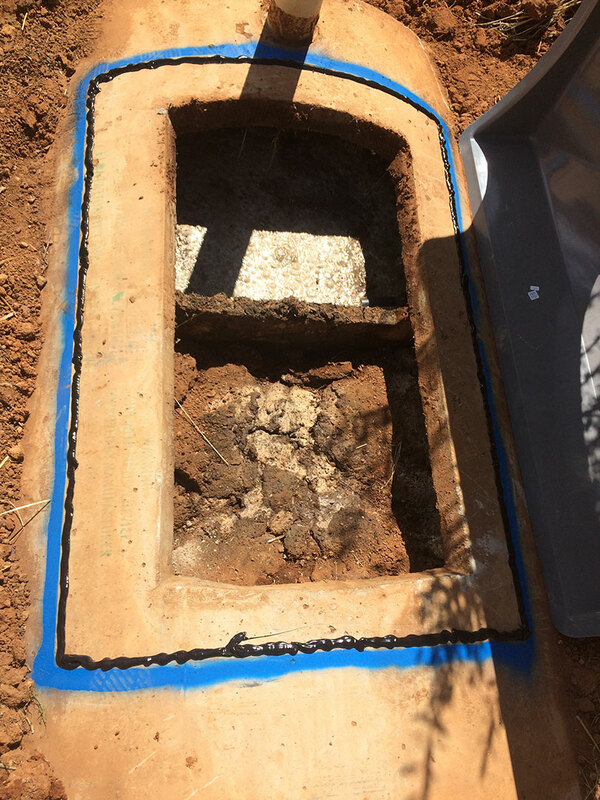 Without good access, or knowledge of your septic tank’s location, regular maintenance is often not conducted and it is easy for your tank to allow untreated sewage into the disposal area. Our septic tank access saddle provides easy access to your septic tank. 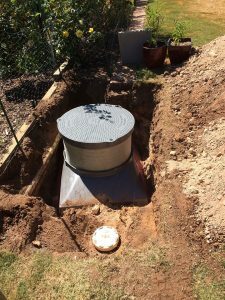 It fits over your septic tank and raises the access cover to ground level, so that you and anyone who needs access to your septic tank can be fully aware of the tank’s location. Once the new saddle is installed on your septic tank, there will never be a need to dig up your tank ever again! 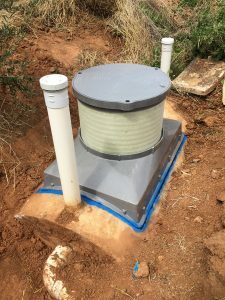 Our septic tank access saddle, and associated sealing ring and lockable cover are made from composite resin—a composition of fibre glass and fillers formed under great pressure and heat. This makes the saddle and cover stronger than steel (weight-for-weight), meaning it will withstand a lifetime of use. The composite resin construction also ensures the access cover is light enough to lift. 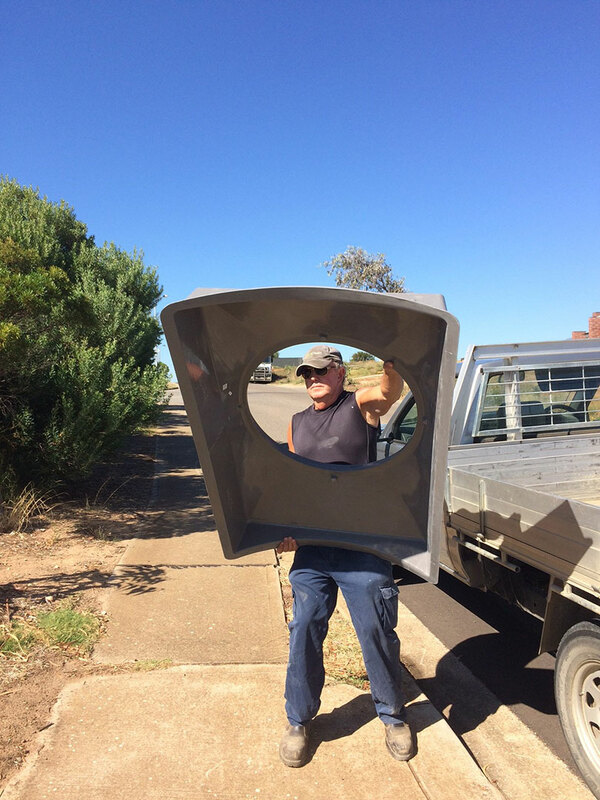 Weighing only nine kilograms, the cover complies with Work Health and Safety guidelines by allowing a single worker to easily lift and remove the saddle when they need to monitor or maintain the septic tank. The cover is secured by three stainless steel bolts and cannot be removed without a socket spanner, making it very safe for children. The access saddle can withstand superimposed loads of more than 1.5 tonnes. The saddle will withstand a lifetime of use. This cover has been in a McDonald’s car park since 2009 and it shows no signs of cracks, breaks, chips, or other damaging wear and tear. BioSeptic developed the access saddle with Access Septic Products, an Adelaide-based septic product specialist company. Together, we have conducted extensive research and development—including 18 months of design and rigorous testing—to bring the access saddle to market. On 29 January 2017, SAI Global provided accreditation for the saddle as an accessory to a horizontal axis septic tank, under the Australian Standard for septic tanks. To maintain our Product Certification for the saddle, we have in place a quality assurance scheme that is regularly audited by SAI Global. The saddle is approved by SA Health with approval number WWP P0002. 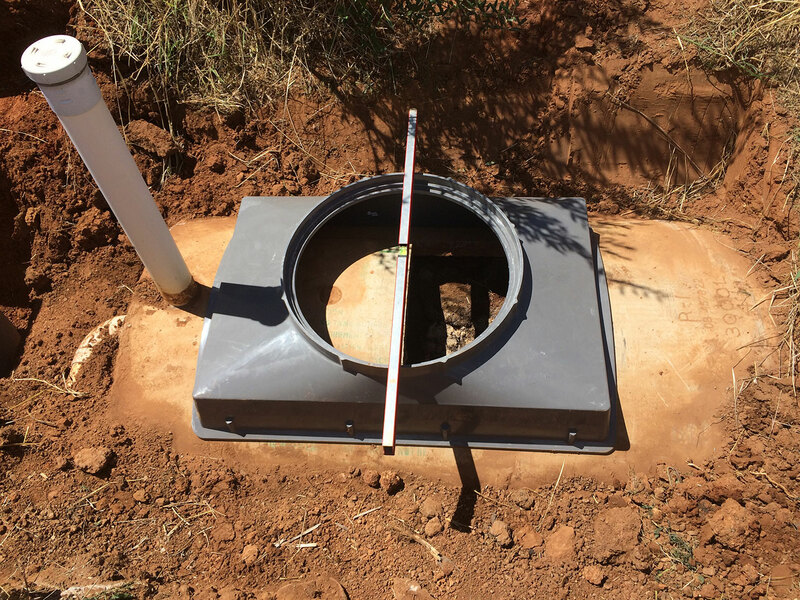 Our septic tank access saddles help you meet Australian Standard AS/NZS1546.1 (relating to the design, performance and testing of septic tanks), which requires that all septic tanks have access openings that allow for regular de-sludging of the tank. The South Australian Government (SA Health) requires that all septic tanks are de-sludged every four years. Bring your tank access position up to ground level for easy access and identification. Have a strong and durable cover for your septic tank. Prevent unauthorised septic tank access—our saddle is water-tight and triple bolted in position. Stop stock falling into your tank. Protect children from accessing your septic tank—our saddle is secure and unable to be removed without tools or by children. Save time and money through having easy access to your tank, for maintenance, monitoring and repair. Comply with Australian Standard AS/NZS1546.1 and SA Health regulations (South Australia). Cars, machinery and appliances are serviced regularly to prolong their life and to keep them safe and reliable. Your septic tank is no different. It requires servicing (de-sludging) to keep it functioning correctly, to protect your family’s health. Contact us to find out more about our access saddle. A full set of instructions is provided with every saddle. Installation can be completed in 15 minutes and there is no need for trucks, excavators or cranes, as the saddle only weighs 22 kilograms. Step 1: Place the saddle in position, ensure it is level and mark the outline. Step 2: Apply sealer and place the saddle in position. Step 3: Seal the extension riser to the saddle and bolt the cover into place. For more information on our products, please call our sales team on 1300 658 111. 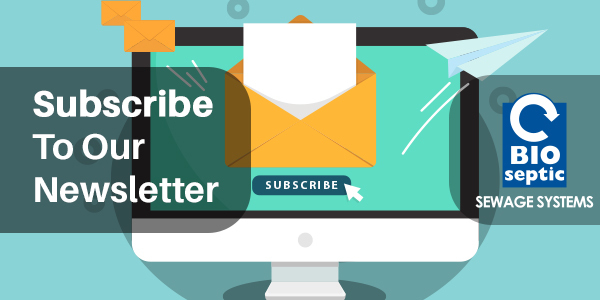 We will be happy to organise a site visit so that we can provide specific answers to your questions.